7.0 inch uart tft lcd display, smart tft lcd screen,800x480 pixels, ROHS, serial UART RS232 RS485 interface, saving the interface pin of MCU through our uart interface tft lcd display module, total 4 pins for the communication only. you could edit the display image by any image editor in computer first, then simply upload the image through USB port to the our uart tft lcd display, our software instruction has inbuilt plenty of design components, such as button, graphic, fonts, circle, rolling bar, instrument tools etc. from our software instruction, you could make what you need to display only by the one or two lines instruction code, 128M byte eprom that could store plenty of pictures, and special GPU can make the picture display in faster speed. 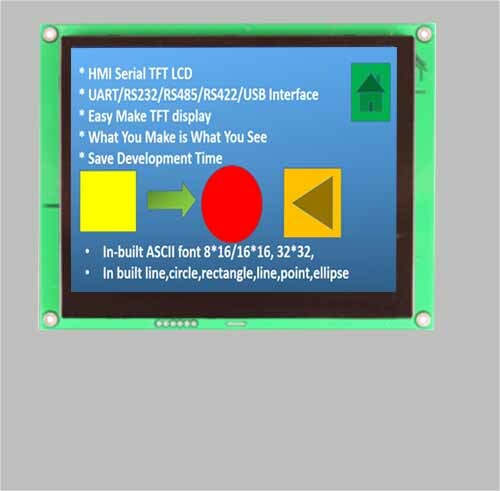 it can save 90% time in your development phase by using our uart tft lcd. it would be the most cost efficiency solution on the smart serial tft lcd display for the volumn production.